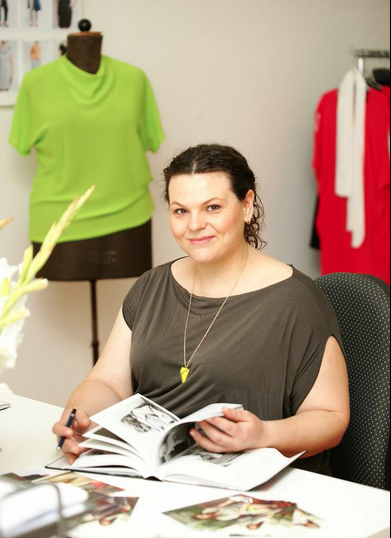 Plus Size Designer Natalia Weiman from Berlin a heart for women with big sizes. mB:Natalia, You tailor fashion for women with big sizes, how did it happen? Natalia:I’ve always had a dress size 44/46 myself. So know all the shopping problems. Nothing fits, is too tight, too short or just boring. Somehow I have managed but from the small selection which one is offered to look for the most beautiful things out. I started my tailoring training early on and so I have always enlarged the small selection for myself a bit and made it a profession to make the selection for other women with similar problems bigger.A pure plus size designer, such as Anna Scholz, I am not.I tailor from size 36, but do not forget the size 54.
mB:What inspires you for your collections? Natalia:The urban life of the city – sounds silly and fits to everyone, but it’s just that. I look at the people, I look at the fashion, I just look at my environment and think “ah, that is a good idea, how can I develop you for me or aha, that is exactly what I would never do”. My collections are very commercial. But that’s exactly what I want. I would like to address a large target group and help her fill herself well. I am also inspired by fabrics, but I go twice a year to Paris for the fabric fair.As soon as I hold a cloth in my hand, I know if I can make something out of it or not. mB:The current collection goes up to size 50. Would you continue one day or is 50 the border to the next complete cut adjustment? Natalia:Somehow I had to start.First, my collection only went from Gr.38-48.For precisely these intermediate sizes were the most important to me.In the small boutiques one has the sizes 34-40/42 found and in the oversize boutiques mostly only from 46/48 and there was the selection also still very small, since the attention on clothing from size 50 is. Relatively fast I have my cuts around Gr. 36 and 50. ***”The demand was there for both directions and this is still a big area in which one can get off with a good deal without having to change the cuts very much. In the three years, however, I got many inquiries to make my collection bigger and there are also many cuts developed, which are suitable to size 54/56.But it’s not that easy anyway. You have to consider a lot of things and try a lot more in both cutting and processing. The choice of fabric is also very important. But it is planned to offer from summer 2014 also an additional collection up to size 56 or 58.
mB:In my perception, the plus sizes are presented in Germany.Do you see this and what do you mean, what is the reason? The Rubensfrauen in other countries are much more self-confident than in Germany in fashion.Therefore, there is greater demand and the designers react to this. But with us in Germany it was always almost forbidden to be overweight and a plus size designer is not really taken seriously in the fashion scene. It was simply not nice and therefore there was nothing nice for it. The fashion consisted of tents that were meant to cover the body. It has only changed for a few years.You can see much more overweight women in the media who are great fashionable role models and Germany is beginning to convert itself.Here and there there is also a new plus size designer from the fashion academy.But it will take some time before we are just as open and self-confident as the English are the Americans or the Scandinavians – they are also very far and as I find the most stylish. mB:Your must have recommendation for the miss BARTOZ Readers autumn/winter 12/13? The Brit chick is coming.that is, a lot of wool, tweed and also velvet.The latter is really for the very fashion-conscious women.I think velvet will need a little more until it has really come through in commercial fashion. Otherwise, skirts and blazers are still a strong theme. However, I would rarely bring both together, acts very businness-like . Then rather a beautiful tweed blazer with elbow patches combined to a sled blouse and a jeans. And the wide skirt, which is also like to be wadenlang to a somewhat narrow cut sweater with large collar. Makes a great hourglass silhouette. For large sizes also a real eye-catcher. is always a bit tricky and many manufacturers and Plus Size designers are rather evasively answered. mB:Often I get comments that the models, which stand for large sizes model, are too narrow. Would you also be a collection of women in size 50? Natalia:I have my third and fourth collection with a model in Gr.50.A friend of mine.The pictures I found great. Now for the new summer collection, I wanted a professional model and since my collection is already starting at size 36, I wanted to cover a model of normal and oversize.Therefore I have one in Gr.42, which was not so easy.Many models have changed and now also offer Plussize model.But a model floor under large sizes understands mostly Gr.38 – 40. Then I wonder what a Gr.50 is? But for the planned new collection up to Gr.56/58 I would go back to a model in Gr.50 or greater.The women who buy the fashion should finally be able to identify with it, and this does not work if they see Gr, 36 in the picture, but a Gr.50. mB : thank you Natalia and as I hear, I can see from summer your collection also in Hamburg, in the corner house … I’m already anxious, but also come gladly again and again to Berlin. The Homepage of Plus Size Designer Natalia Weimann.